1. Bring a pan of water to the boil. Add the noodles, simmer for 3 minutes, then drain in a sieve and rinse under the cold tap. Toss with 1 tsp sesame oil in a bowl and set aside. 2. Set a large wok over a medium-high heat. Cut the broccoli into bite-sized spears and add to the pan with the sunflower oil, ½ the ginger and 4 tbsp water. Stir-fry for 2-3 minutes until the water has evaporated, then add the cabbage and stir-fry for 2 minutes until just wilting. Meanwhile, in a small bowl, mix the remaining ginger and 1 tsp sesame oil with the soy sauce, honey, lime juice and 1 tbsp cold water. 3. Add the prawns to the wok and stir-fry for 2 minutes until heated through. 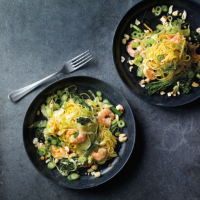 Push the prawns and vegetables to the side of the pan, add the noodles and most of the salad onions, spoon over ½ the soy-ginger dressing, then toss together gently. Top with the cashews and remaining salad onions and spoon over the remaining dressing to serve.